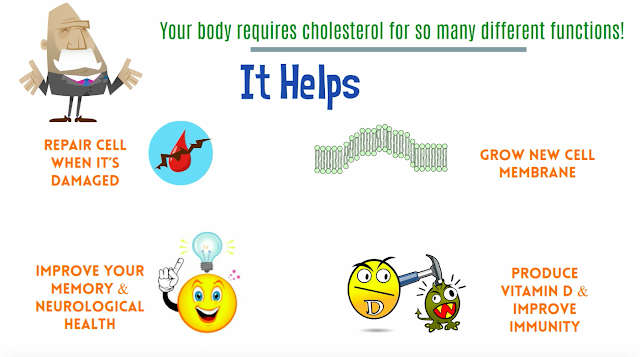 HOW CHOLESTEROL KEEPS OUR BODIES HEALTHY? 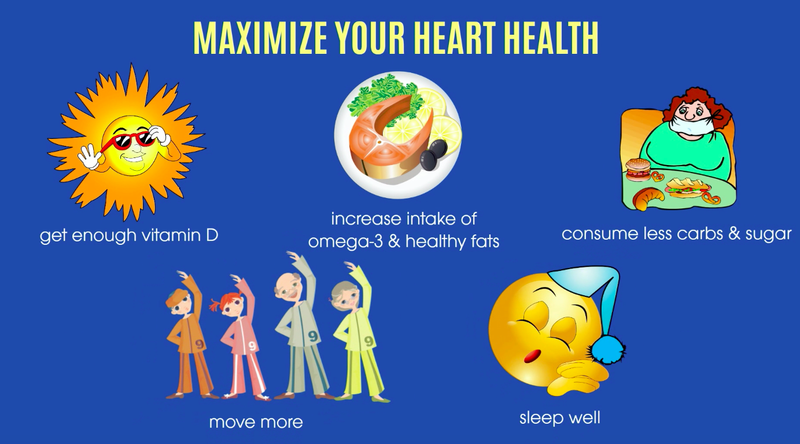 Cholesterol is one of the most common household names today! For long, the eggs, saturated fats, animal fat have been attributed as the number one cause of heart disease! What if these had no connection to heart disease, strokes, and cardiovascular disease? So, what’s the truth behind this great cholesterol myth? As a matter of fact, 75% of cholesterol is produced by your liver and your body requires cholesterol for so many different functions. Right from repairing cell, to grow new cell membrane, production of vitamin D, production of other hormones - cholesterol is required for good health, it’s required for your memory. it’s required for neurological health, and there are connections to low cholesterol to alzheimer’s; cancer, parkinson’s disease, diabetes, neuromuscular pains, joint pains, bloating, inability to lose weight, and a host of other factors. Does cholesterol lead to heart attack? Absolutely not! Heart attacks occur due to inflammation in your arteries. Heart attacks occur from high blood pressure which is poorly managed. Heart attacks occur when your triglycerides are extremely high and your good cholesterol is extremely low. 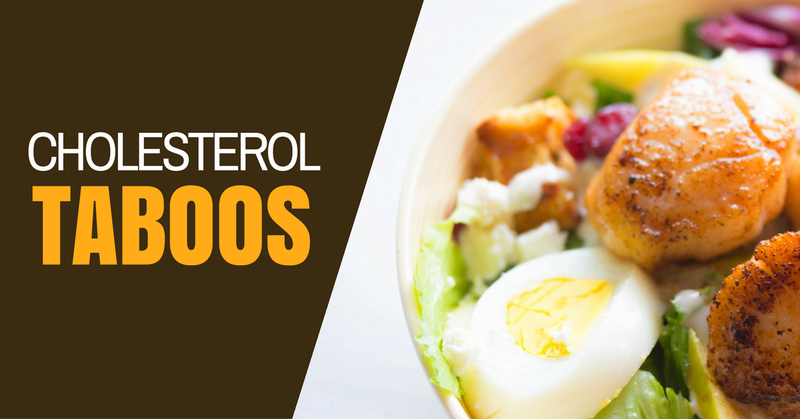 So, you need to look beyond your cholesterol levels and understand your HDL & LDL profile. You get cholesterol from two sources, i.e., from the food you eat and from your body. Your liver makes all the cholesterol you need and circulates it through the blood. HDL, your good cholesterol has a function of cleaning bad cholesterol out of your arteries, removing plaques; so you want high levels of HDL. So, what about high levels of LDL? It's not the LDL, but the LDL particle size that matters. The large LDL particles do not cause problems to heart. But if you have small LDL particles, they could cause potential damage to your heart. Then you have triglycerides and they are the villains. When you have high levels of triglycerides, it can lead to plaque build-up in your arteries, which can cause clots in your brain and eventually a stroke and paralysis of your body. 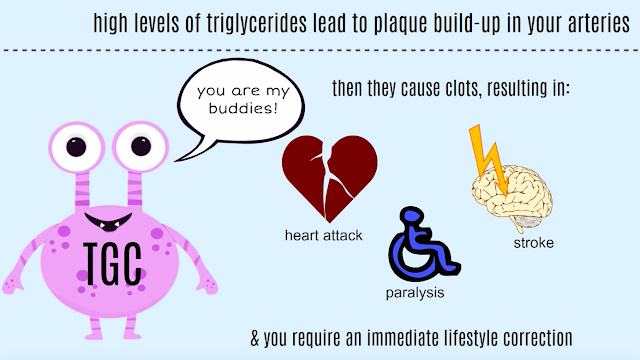 Therefore, if you have high levels of triglycerides, that puts you in a potential high risk category and you require an immediate lifestyle correction. Eating wrong grains, sugar, inactivity, smoking, excessive alcohol consumption, overweight, obesity, and constant stress - all these can contribute to high triglycerides level. 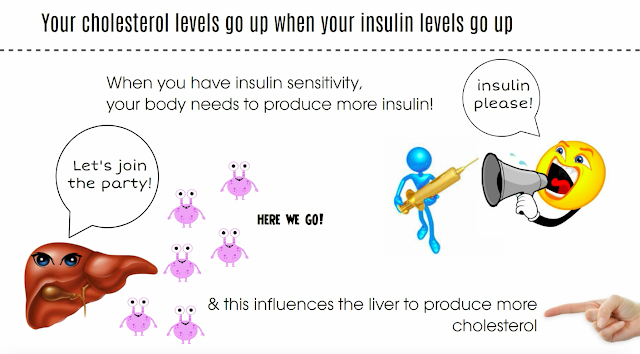 Your cholesterol levels go up when your insulin levels go up! Your cholesterol levels are directly proportionate to your insulin levels? Which means, when you have insulin sensitivity your body needs to produce more insulin and your liver produces more cholesterol. That makes a diabetic to automatically have high levels of cholesterol. What needs to be done? Well, work on controlling your blood sugar; work on bringing down your insulin level and you automatically bring down your cholesterol level. That is the connection between insulin and cholesterol, and it comes down to what you eat. If you eat constantly processed sugar & bad carbohydrates, your insulin level will remain high and your cholesterol level also is going to be high. You run to a doctor who puts you on a pill for diabetes, another pill for cholesterol and yet another pill to manage the side effects of both those pills that you are taking for diabetes and cholesterol without realising the natural response of our body. When you constantly eat wrong foods, have poor circulation due to inactivity, eat less of plant-based food, nuts, seeds, you start damaging the endothelial cells in your arteries and inflammation sets in, which causes constriction in your arteries, leading to poor blood flow. What also happens is your blood thickens and all of a sudden you have high blood pressure. Over time, this high blood pressure can cause clot in your brain, in your artery, or at any part of your body which eventually leads to stroke, paralysis, cardiac arrest, and death. 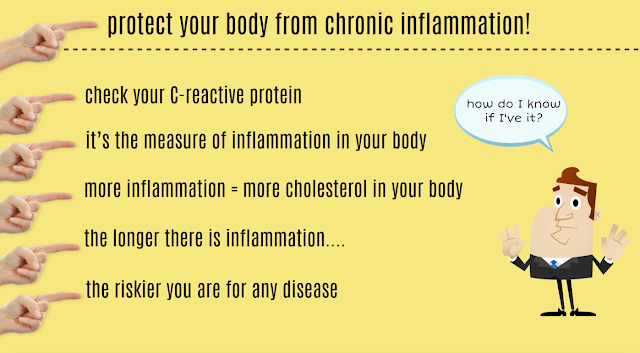 End of the day, it’s your job to reduce inflammation and thereby the amount of cholesterol in your body. You were asked to stay away from foods like egg yolks, saturated fats, coconut oil, etc. In fact, your body needs them. Healthy lifestyle choices and regular exercise routine protect your body from chronic inflammation, and your liver need to work harder to produce more cholesterol. Parkinson’s disease is a progressive neurodegenerative illness characterized by reduced dopamine levels in the brain. if you are suffering from this disease you can visit our site. Parkinson's treatment we are providing the best treatment for this disease.